This picture taken on October 2 last year shows Lagerfeld with Viard. The fashion world was plunged into mourning yesterday by the death of legendary designer Karl Lagerfeld, the rapier-witted dandy who ruled over the industry for half a century. Speculation about the state of health of the man they called the “Kaiser” had been rife since he missed Chanel’s Paris haute couture week show last month, with the world’s richest brand saying that he “was tired”. However, speculation about his health spiralled last month after he missed the first show of his life, with Chanel executives saying that he “was tired this morning”. 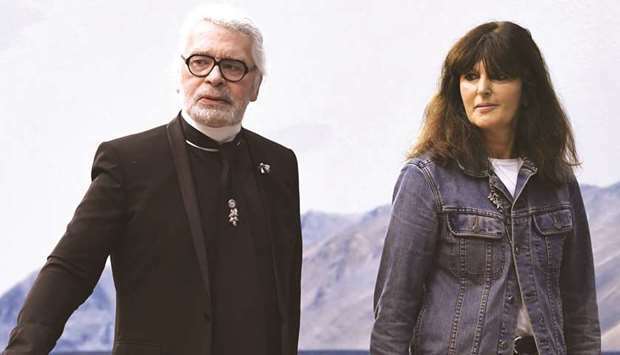 Chanel said the reins of the $12.7bn brand had been handed to Lagerfeld’s right-hand woman, his head of studio Virginie Viard. In an equally emotional tribute, actress and model Diane Kruger said that she was not able to get to his bedside in time. British pop star turned fashion designer Victoria Beckham called Lagerfeld “a genius”, a description that was ever-present. Fellow British designer, writer and model Alexa Chung said she was “so scared” when she first met the designer, but Lagerfeld was “incredibly witty and generous”. “Thank you for inviting me to some of the most glamorous experiences of my life. And thanks for the dry shampoo tip. Will always think of you as I powder my wig,” she joked on Instagram, echoing the designer’s own love of repartee. Politicians also queued up to pay tribute to the designer. Fendi said it would go ahead as planned with a Milan fashion show of Lagerfeld’s latest line for the brand tomorrow. On January 22, Chanel hosted guests in a mocked-up Mediterranean garden for its haute-couture show. In a collection inspired by Lagerfeld’s favourite period, the 18th century, feathers adorned new twists on the brand’s classic tweed suits, which came with ankle length or fishtail skirts.